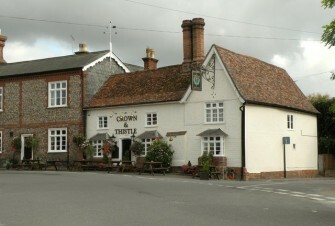 Crown and Thistle pub at Great Chesterford. Image used under Creative Commons Attribution-ShareAlike licence. The clip is from a radio programme, ‘Voices from my Village’ (SA 34/1/1/5/1/3/1). The programme was created by Carl Huson about the village in which he lived, Great Chesterford, as a representative of a typical English village. Neither the village nor the pub are ever named in the programme. Was it recorded in what is now the Crown and Thistle (pictured), or perhaps the Plough? Local pubs often attract distinct clientele: how would this affect the soundscape within? How much has the sound of ‘the local’ changed in the last fifty years? Is the general hubbub of voices the same? Do any pubs in Great Chesterford still contain a piano? How much has technology intruded on the atmosphere, such as mobile phones, televisions, and slot machines?